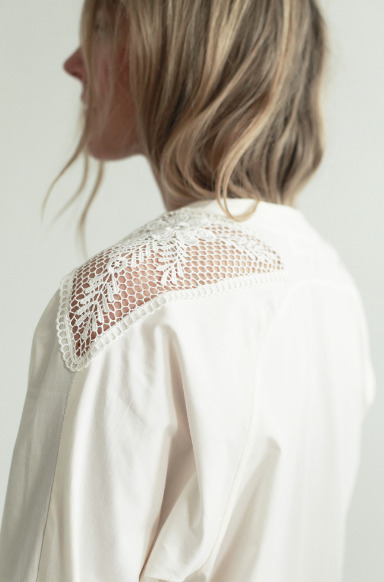 Collarless shirt dress in our off white organic cotton poplin with lace appliqué at shoulders. Round neck and front placket closure with Corozo buttons. Long, Raglan sleeves with cuff. Side seam pockets. Curved hem with side cut outs. FIT | XS-L, Johanne is wearing a size S. Relaxed fit. Hits at calf. MODEL | Johanne is 5’8″ (175cm) & wears size S, EU 36 and US 4.